Youth participants pose with their mentors at the December 2010 launch of Through the Gender Lens, a handbook to help combat violence against women. 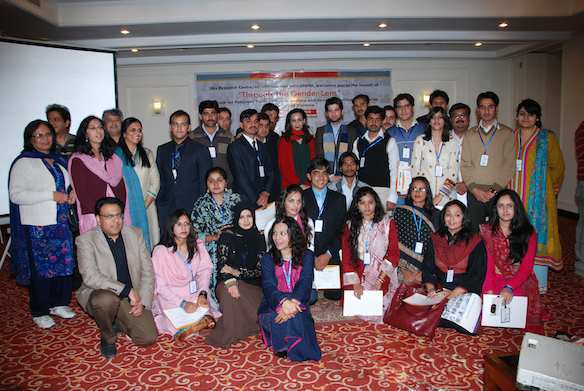 Through the Gender Lens, a handbook – and also the culmination of a yearlong collaborative effort between Uks and UNFPA (United Nations Population Fund) and 39 youth selected from around the country – was launched in Islamabad on Human Rights Day, December 10. Aged between 15 and 25, the group of 39, which included an equal number of male and female members, hailed from both the urban centres and rural districts of the country: Chakwal, Jacobabad, Quetta, Peshawar, Waziristan, Mansehra, AJK (Azad Jammu and Kashmir), Lahore, Karachi and Islamabad. In March, the group met for the first time for a one-day orientation session in which they were introduced to the project, the aims of which were to create awareness regarding gender-based violence, promote gender equity and equality, and advance the view that women’s rights are human rights. The participants went through a rigorous training process over the passage of the year. Divided into three groups according to their areas of interest (print, radio or TV), they were educated on what gender-based violence was, trained to deconstruct media messages (projections and stereotyping of women in the media as well as the manner in which gender-based crimes are reported) by monitoring a selected number of TV and radio programmes and print matter, and tasked to eventually produce gender-sensitive media content of their own. Once equipped with the gender lens and the technical skills, the youth returned to their respective hometowns to begin peer training – it was expected of them to pass on what they had learned to at least 35 people in their communities – and complete their media productions that they were required to turn in by the end of the year. A panel comprising some of the members of the core group, including Dr Salman Asif (UNFPA), Amir Mateen (Senior Correspondent, The News, Islamabad), Rana Jawad (Bureau Chief of Geo TV, Islamabad), Tasneem Ahmar, as well as guest speakers Sherry Rehman and the director of the HRCP, I. A. Rehman, worked closely with the participants and addressed the audience. The panel lead a discussion in Islamabad on December 10. These 39 youth who, according to Rana Jawad, have already reached out to people in their areas and beyond to spread awareness, were to him “passionate and inquisitive, like a new lease of life.” Amir Mateen stressed the need to strike a balance in newsrooms as far as a female presence was concerned, without which, he stated, reporting could not become gender sensitive. However, gender-based violence needed to be highlighted more in the mainstream media, he added. “When nobody viewed media as a construct, as something that shapes reality,” said Sherry Rehman, “Tasneem started this project: how the media covers gender-based violence and how it projects stereotypes. This is a grassroots project.” Addressing the participants, she said that Uks had equipped them with a revolutionary tool and they should ensure that the initiative is taken forward, that it remains an ongoing process and they become the ‘agents of change’ everybody sees them as. The handbook, which was provided to all the guests at the event, details the different activities the participants were involved in as part of their training. It is available in both Urdu and in English. It also serves as a training manual for those who want to conduct peer training of their own. 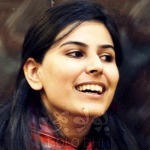 Farieha Aziz is a Karachi-based, APNS-awardwinning journalist. She is a co-founder and Director at Bolo Bhi. She has a masters in English literature. She worked with Newsline from July 2007-January 2012 and taught literature to grades 9-12. She served as an amicus curiae in a case filed in the Lahore High Court in 2013, challenging the ban on YouTube, and is currently a petitioner on behalf of Bolo Bhi in a case filed in the Islamabad High Court challenging government's censorship on the Internet and the powers of the regulator. When she is not raging over Internet censorship or poor Internet connectivity, she chooses to turn to cricket, Star Wars, Lord of the Rings, Harry Potter and qawwalis for sanity.